It’s hard to prepare a group of students for what to expect when visiting an active project, especially one as involved as Bonehenge is. 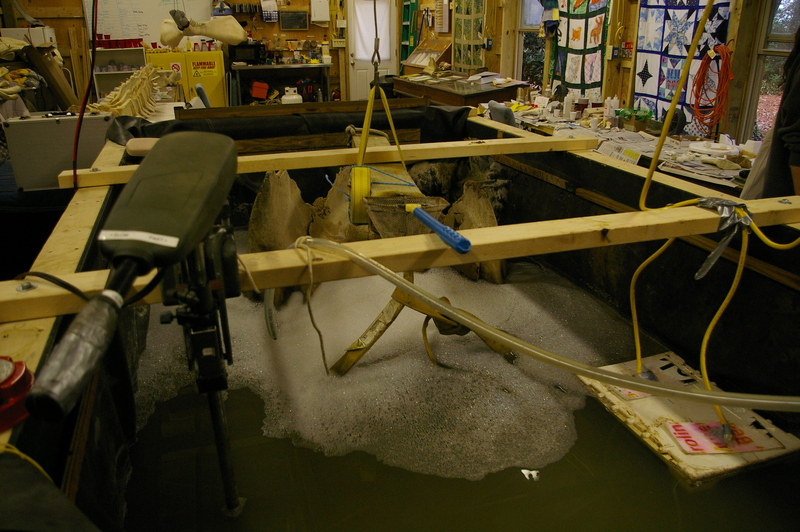 Museums and static displays are great, but the opportunity to see a display like this being assembled, with a tour lead by its chief architect, is an experience that you just have to let happen. So let me begin buy giving a huge thank you to Keith Rittmaster, who opened up Bonehenge for my Science and Nature Writing Class. Bonehenge is a barn, raised in 7 days completely by volunteers, and built to house the Sperm Whale skeleton until it was ready for display. 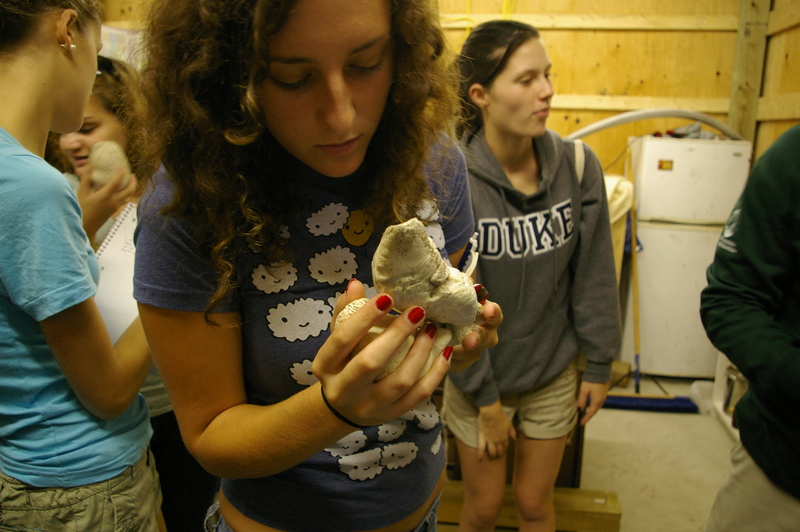 Inside is a strange and wonderful assortment of marine mammal parts, donated or collected by the project. Each piece has its own story to tell. 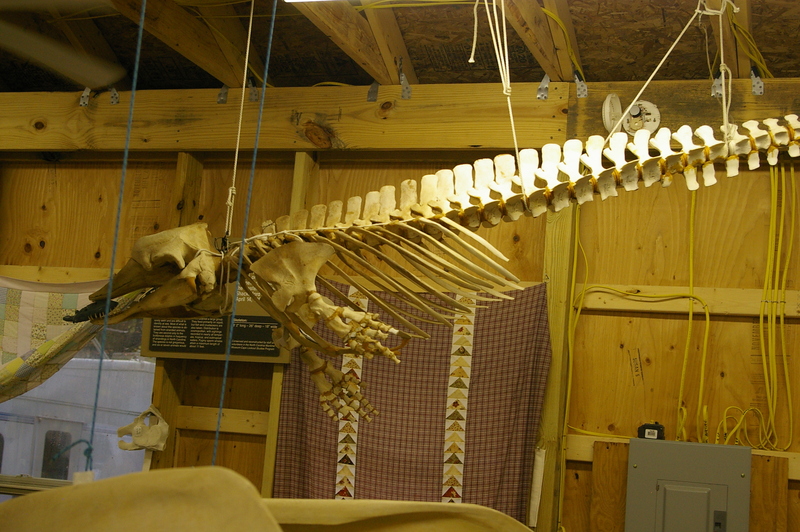 The Fin whale flipper on the wall is Rittmaster’s first attempt at mounting a whale part for display.On the ceiling hangs a fully rearticulated Pygmy Sperm Whale, his first attempt to mount an entire skeleton. 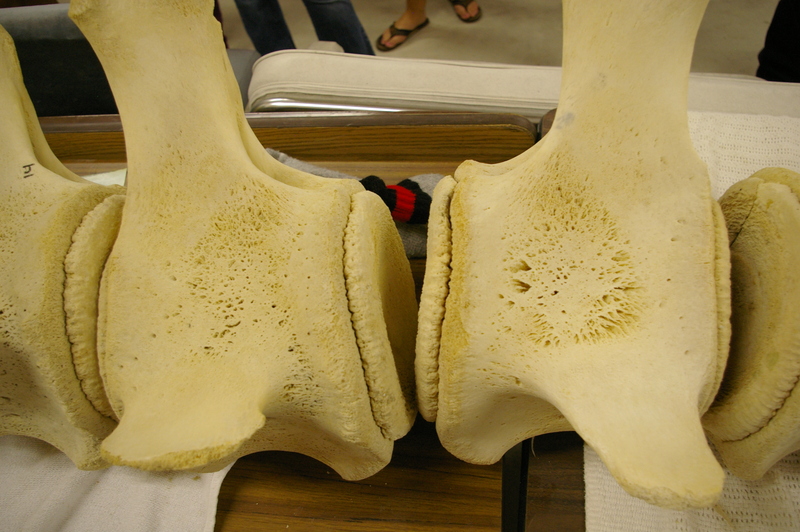 He admits that several on the bones are positioned wrong, every new mounting is an attempt to improve. But the real centerpiece, the reason Bonehenge exists, is the complete skeleton of a Sperm Whale, Physeter macrocephalus, in various stages of preparation. The cranium and maxilla sit in a vast chemical jacuzzi, slowly having the oil drained out of them and removing residual organic matter. Other bones were small enough to be cleaned in a vapor degreaser, but these three were far too large. 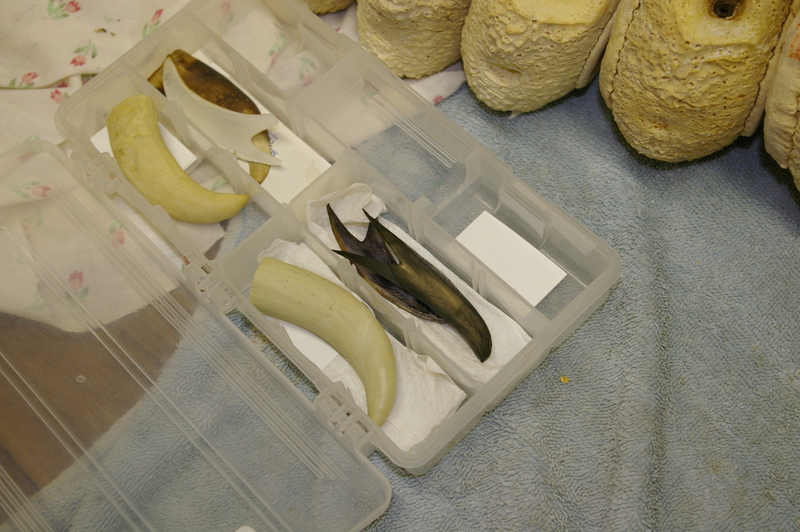 One of the fins was sent off to be x-rayed before decomposition, to act as a guide for rearticulation. During the process, Rittmaster learned that Sperm Whale fins are asymmetric – they don’t both contain the same number of bones. 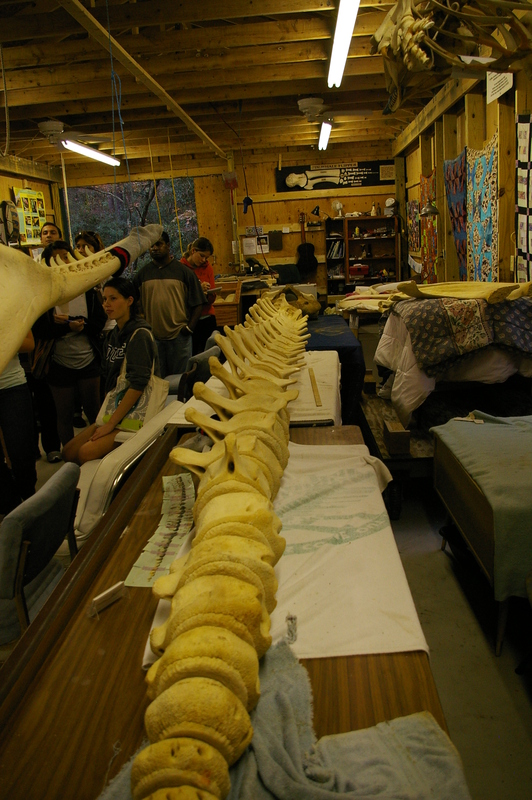 The vertebrae are laid out along a long table, carefully ordered. Each vertebra has two growth plates associated with it. Each growth plate fits perfectly against only one side of the vertebra. The teeth have their own story to tell. Of all the artifacts at Bonehenge, the teeth are the only parts that Rittmaster is worried about people walking off with. Sperm Whale teeth are valuable items, blackmarket teeth can fetch up to $8,000, and so the final display will feature casts of each tooth, with the originals safely locked away. The casts are near perfect replicas, you can even see the line where the teeth erupted through the gums. The teeth also provide the surest way to age a Sperm Whale. Like the rings of a tree, each tooth has concentric growth rings. Rittmaster went through the painstaking process off delicately slicing teeth in two, then producing thin flakes which can be stained and counted. This whale was 15 years old when it died – young for a Sperm Whale. 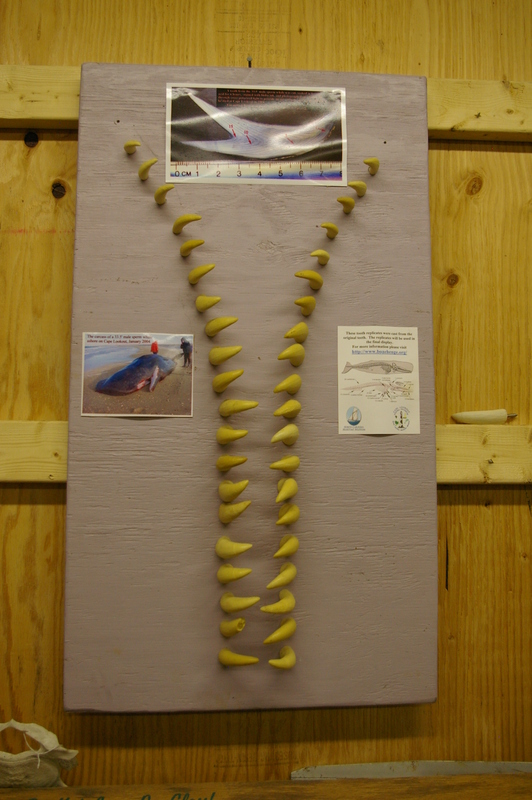 Rare for Sperm Whale, this individual had no plastic in its stomach, only squid beaks and common gut parasites. The jury is still out on how this whale died. The ear bones are yet another piece of the puzzle. 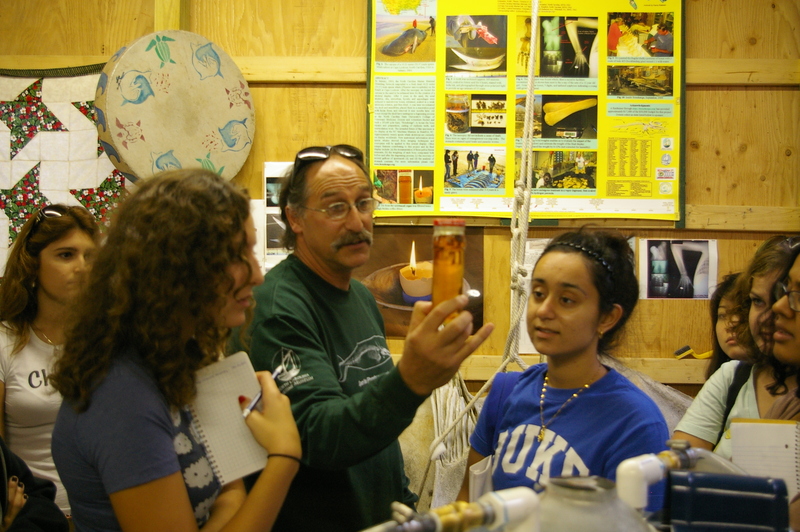 Had the ear bones from this whale been preserved, a lab at WHOI now has the capability to determine not only whether or not the whale had hearing damage, but at what frequencies and how long before it died. 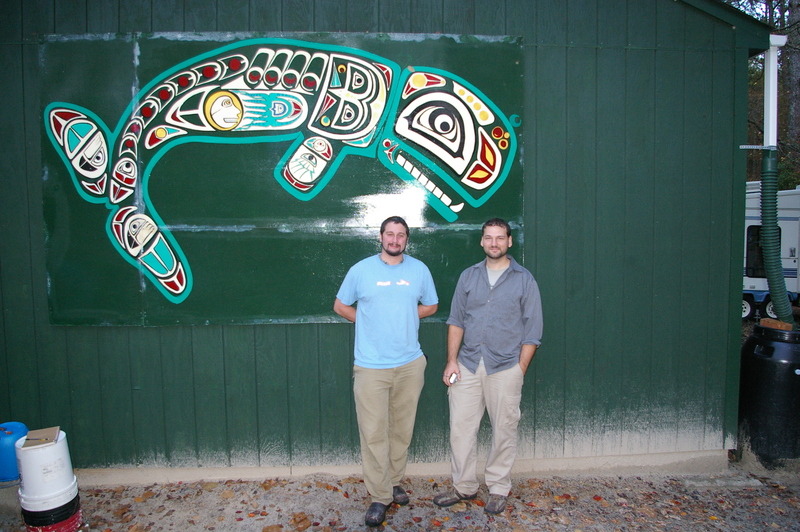 This technology has already been used to link marine mammal strandings to Navy Sonar tests. 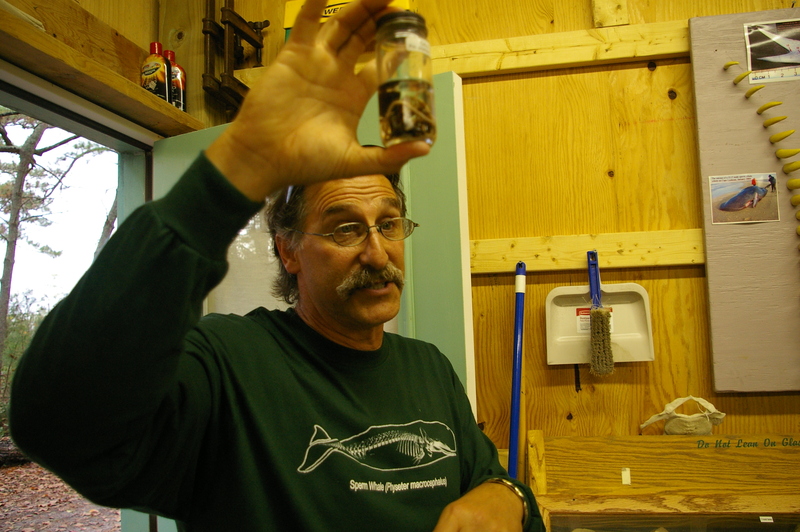 Outside the barn, Rittmaster shows us some more oddities. 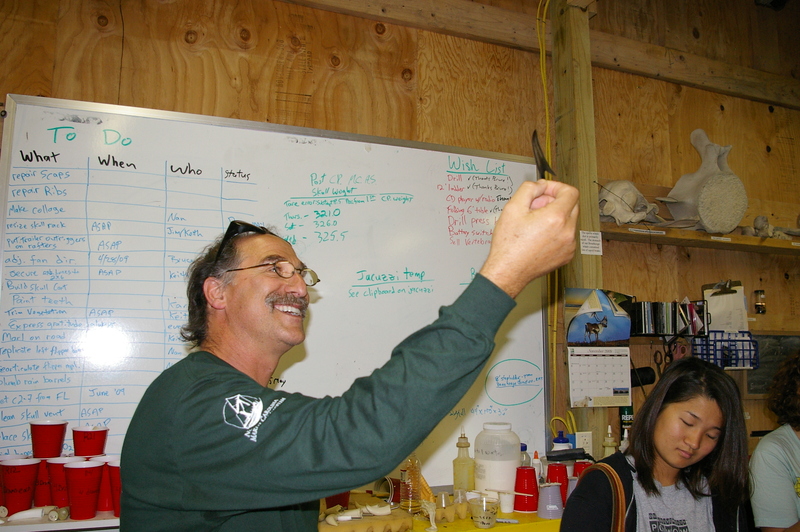 A rib bone, the largest he’s ever seen possibly from a Blue Whale. It was anonymously deposited at the Maritime Museum along with a cranium. 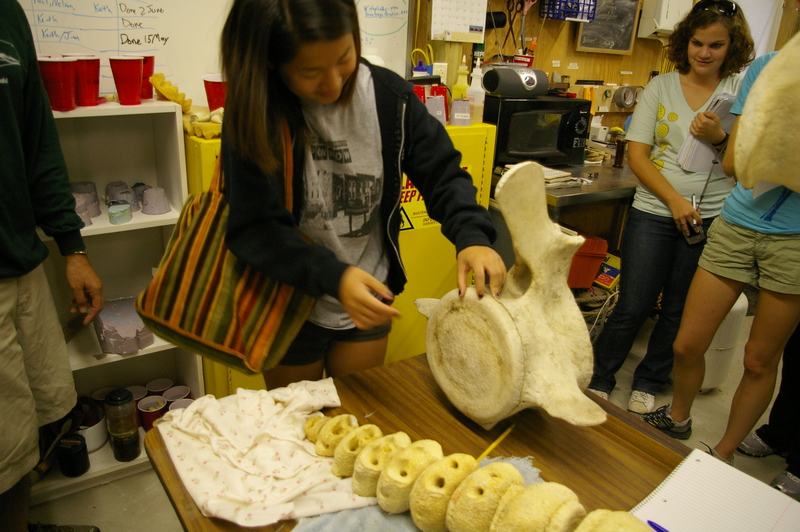 Although old whale bones are commonly found around former whaling towns, from family collections or simply abandoned in yards, many people do not want to be associated with that part of our history, and find ways to quietly get rid of these artifacts. 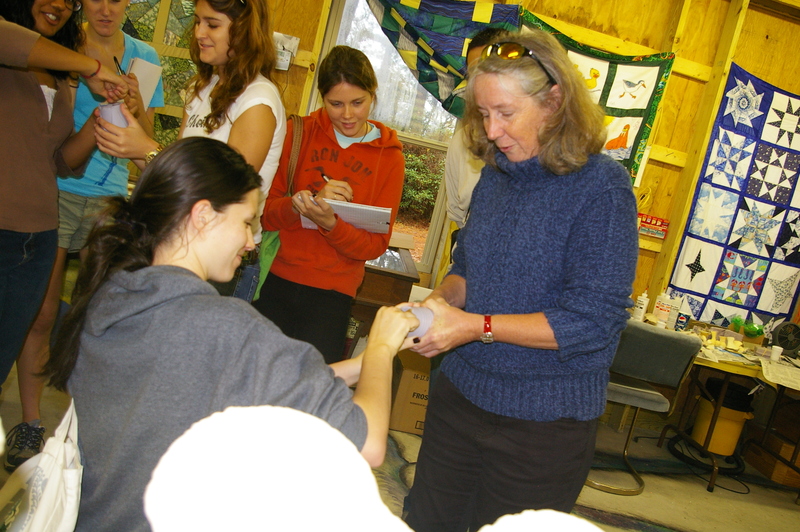 Even in it’s larval stage, Bonehenge is a tremendous opportunity for education and outreach, for teaching students about the history, biology, and ecology of marine mammals. 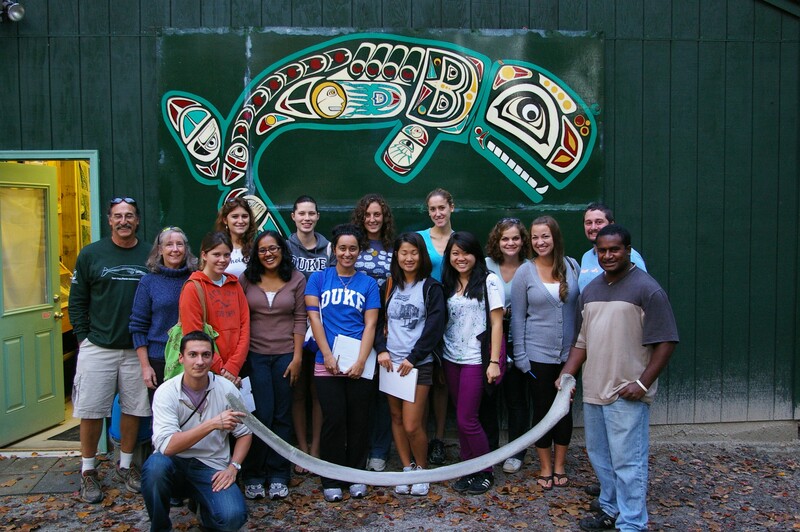 Education and outreach continue to be the most powerful tool in the growing arsenal of marine conservation. If you would like to contribute to Bonehenge, you can find all of that information on their website, here. Correct me if i am wrong, but I don’t see the famous Southern Fried Science mascot in here. I can’t find Charlie!